And they created the art of slow food passed down through generations. It begins in the morning when mama and/or Yiayia (grandma) visit the farmers market for the fresh produce they will use in the daily meals. The market teams with women (and quite a few men) leisurely strolling and loudly bantering with the merchants. This is a social occasion as much as it is a shopping trip. Slow Food for the Soul Lesson #1: People are more important than tasks. Preparing a meal is an all day affair of cleaning, chopping, shredding, baking, boiling, and chatting. 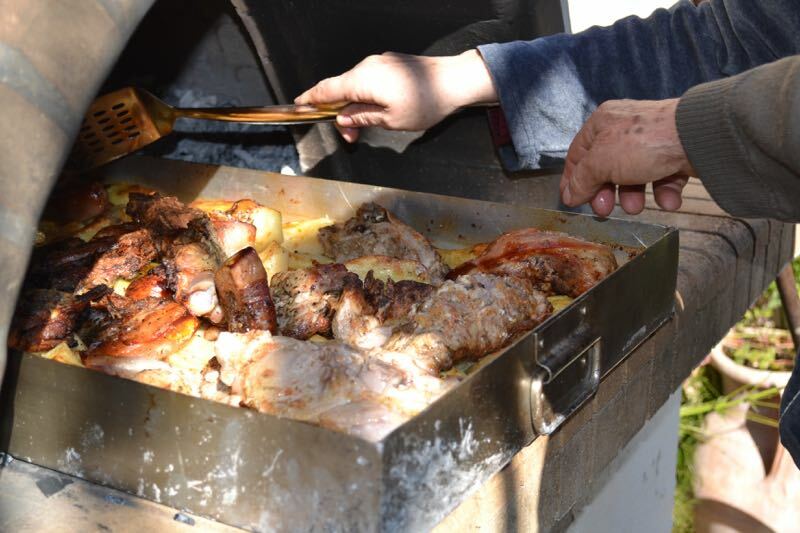 Smells of garlic, lemon, oregano and succulent meat waft from the kitchens all around town. When the family sits down for a meal the table is simply set with one plate each, a set of silverware, local wine and food enough to feed an army. On any given day you might see a fresh salad, fresh baked bread, mezethes (Greek appetizers), pastisio (basically mac and cheese), big beans, roasted vegetables, lamb kleftiko (slow cooked in parchment paper), beef stifado (slow cooked in a pot) or lemon chicken (slow cooked in the oven with potatoes). Or all of the above. Even more revered than the belly-satisfying, mouth-watering food is the time-honored tradition of creating and preparing and partaking of it together in community of family and friends – slowly, intentionally, fully. Slow Food for the Soul Lesson #2: Fast “food” fills our stomachs. Slow food satisfies hunger – body and soul. I challenge you to slow down, grab a friend or family member and a glass of wine while you prepare this succulent recipe. Then sit down for a while and forget about the next thing on your schedule. Better yet, empty your schedule and enjoy. You’ll be glad you did AND you’ll be back for more! Peel potatoes and cut into wedges. Place in large baking pan or clay pot. Lay chicken pieces on top. Cut garlic cloves in half. Slice small hole in each breast and insert 1/2 clove. Lay others around pan. Add oregano and pepper. Dissolve mustard in mixture of lemon juice and zest and pout over chicken. Add salt, oil and water. Cover and bake at 350 degrees for 1 hour. Uncover, return to oven and bake for 10 minutes or until golden brown. Serve with all the juices.